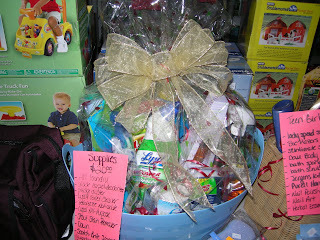 SavingYourCents : Baskets For Thought Or For Profit! 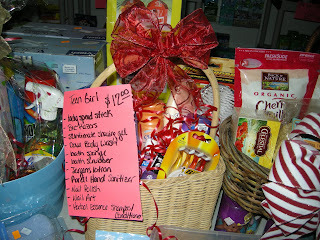 Baskets For Thought Or For Profit! 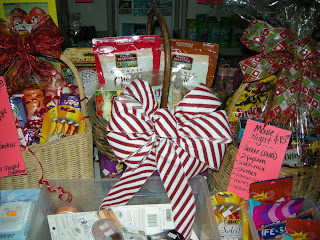 I have so many items in my stockpile that occasionally (during holidays) I create and decorate baskets to sell or for gifts! 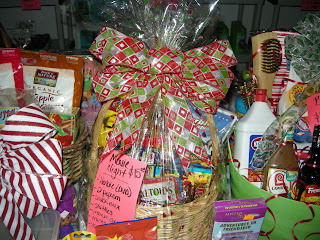 I also like donating baskets like this to shelters and families who need them! This year the Hope House, a shelter for men only who are recovering alcoholics/drug users or who were just released from jail will get a basket of cleaning items similar to the one in the picture! They are so appreciative of anything that they can get. Cleaning supplies are very expensive if you do not buy them on sale and usually places like this end up paying full price for the items! Idea! The next time you pay .10 for a bottle of Lysol, spare an extra one to a local shelter! I can stretch my dollar and donate even more by using coupons! I always set a budget for my donations and see how many items I can get for that amount! You would be amazed at how far $20 or $30 can go! You see it each week when I post my shopping trips! I would like to give GREAT thanks to my grandmother for teaching me how to make my bows! 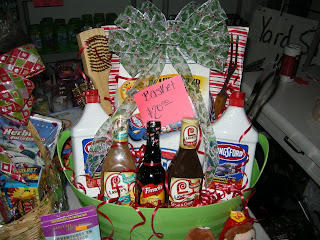 Maybe this article will inspire you to be creative with your stockpile!